Heat the olive oil and butter in a large saute pan over medium heat until butter foams. Sprinkle with 1/2 tsp. sea salt and stir until the mushrooms start to release their moisture and begin to shrink, 2 - 3 minutes. Increase heat to medium-high so that you hear a steady sizzle; stir occasionally. In about 5 minutes, when liquid evaporates and mushrooms begin to brown, give just an occasional sweep with the spoon (about once a minute) to let the mushrooms brown nicely, cooking them another 2 - 4 minutes. Resist desire to stir too often. Turn off heat and toss in the parsley and pepper to taste, adding more salt if needed. Meanwhile, thaw the puff pastry at room temperature until pliable, 45 minutes. Position a rack on the bottom rack of the oven at 425 degrees F.
Lightly dust work area with flour. Unfold the pastry sheet and roll into rectangle about 10 x 15 inches, and about 1/16" thick. Slide it onto a baking sheet lined with parchment paper. With the exception of about an inch border around the edges of the pastry, prick the pastry all over with a fork. With a pastry bush, brush the beaten egg over the border only (you won't need all of it). Bake until the pastry begins to puff and the surface feels dry, about 5 minutes. 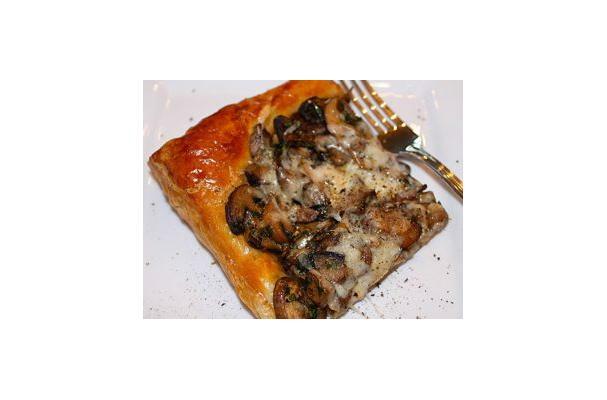 Scatter the sauteed mushrooms onto the pastry, leaving an inch of the border uncovered. Bake until the crust border is puffed and deeply golden brown, about 10 minutes. Scatter the cheese over the mushrooms and continue baking until the cheese melts, another 5 minutes. Let cool briefly on a rack. Slide tart off of the pan and parchment paper.